A 3rd round of Malta Poker Festival satellites atIntertops Poker will be sending another winner to the world-class €500K Mediterranean poker tournament. 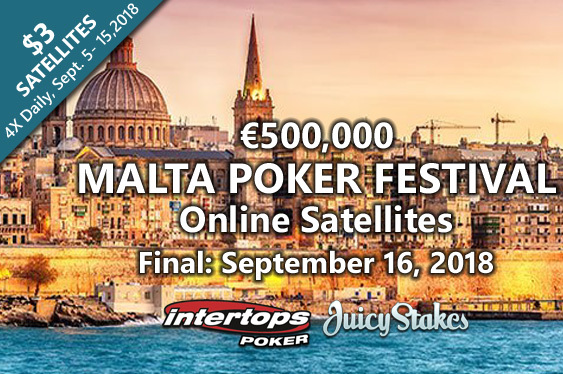 $3 online satellites for the €500K GTD Malta Poker Festival begin September 5th at Intertops Poker and Juicy Stakes Casino. Qualify at Intertops & Juicy Stakes Poker. Seat only qualifiers start Tuesday. Qualify online with Juicy Stakes Poker. Intertops qualifier set for WPT Venice. 888 will exclusively host official satellites.